At a press conference Monday morning, Peoples Gas and North Shore Gas shared a milestone in the constructions of the utilities’ new 100,000-square-foot, state-of-the-art training center in Little Village at 4228 W. 35th Place. “We are building for the future,” said Lori Flores Rolfson, vice president –operations and maintenance, Peoples Gas and North Shore Gas. “This new training center will help us meet future retirement challenges while creating new opportunities for students, our employees, and our community.” According to Peoples Gas and North Shore Gas, the center will provide training for 1,600 employees of Peoples Gas, North Shore Gas and their contractors annually. The center will also equip Chicago high school students for careers as utility workers through a vocational training program in partnership with the Little Village Lawndale High School, Fenger Academy High School, and Dunbar Vocational High School. 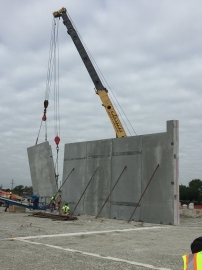 On Monday, the first eight 22-by-10 foot insulated concrete wall panels were raised on the site. 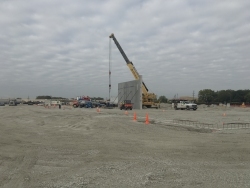 According to Rolfson, 12 to 16 wall panels per day will be installed over the coming weeks. UJAMAA Construction Inc., a Chicago minority-owned general contractor, was hired as the contract for the training center, which is slated to open by summer 2017.